Researchers at the University of California have exhibited examples of a tattoo which can convert human sweat into pure energy, which could one day be used to charge up your smart phone. In order to create energy during strenuous exercise, the body uses a process called glycolysis to breakdown sugar. As well as energy, this process creates a product called lactate, which is released naturally in sweat. The biological battery works by using an enzyme containing bioanode to separate the electrons from lactate, creating a weak electrical current. "We screen-printed the biofuel cell onto tattoo transfer paper, which can be easily mounted onto the skin. 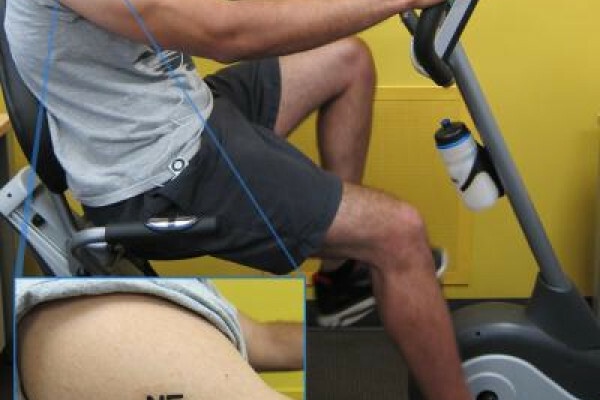 This means the tattoo can scavenge energy from sweat to generate electricity." The prototypes were tested at the meeting of the American Chemistry Society this week, with several volunteers wearing the tattoos on their arms, and engaging in strenuous cycling. The amount of energy generated is currently very small, slightly less than is needed to power a watch. With further work however, they could be used to power things like heart monitors, or maybe one day could even generate enough energy to recharge your phone. The amount of energy created depended on how fit you were, but it was the least fit of the participants who created the most lactate, and therefore the most energy. This is because the fitter you are, the more efficient your muscles are and the less sugar you need to break down. Powering things from the body has been attempted before, but according to Joseph Wang, this addresses the problem in a non-invasive manner, as they are small and easy to wear. They also don't create toxic by-products and are completely renewable. It might be a few years before you can jog your phone up to full battery, but there are ways to increase the efficiency of these biofuel cells, such as increasing sensitivity to lactate, and this could lead the way to a huge range of future applications. How do volcanoes impact the environment?